The HPP Dabar is under construction despite of irregularities in the project EIA study and active opposition by national and international NGOs and scientists. 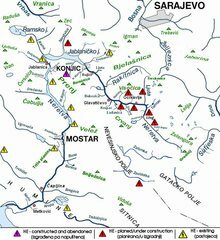 The plan for building the Hydro Power Plant Dabar has been part of a complex and old Yugoslavian project called ‘Gornji Horizonti’ (Upper Horizons) from 1950. Although it had never been built, it is now entering again the European scene. The original project, part of which is the HPP Dabar project, was reconsidered as Bosnia have faced growing demand for clean energy; however its economic viability is being criticized. In 2013, the European Commission-backed Energy Community backed a series of projects of hydro-power plants and coal plants for the production of electricity in the candidates countries (known as Projects of Energy Community Interest (PECI)). If one looks into projects' details, it becomes clear how the EU-backed body has prioritized projects that directly conflict with EU goals. According to Bankwatch, "The selected 'Projects of Energy Community Interest' will be fast-tracked and prioritized for financing over the coming years, in particular by the EBRD and EIB. Yet several of the projects are aimed at exporting electricity rather than meeting local needs, while others will perpetuate the region's addiction to lignite power." The construction of the HPP Dabar implies rerouting of the underground water from the catchment basins of the River Neretva to the basin of river Trebišnica in order to fill the reservoir. This represents a great threat to the Hutovo Blato Nature Park, one of the largest Ramsar habitats (7400 ha) of migratory birds in the Balkans, which could dry up. It will also affect the Nature Park Neretva Delta in Croatia as well as reservoirs of fresh drinkable water and vast agricultural lands in lower Neretva valley, both in Bosnia and Herzegovina and Croatia. 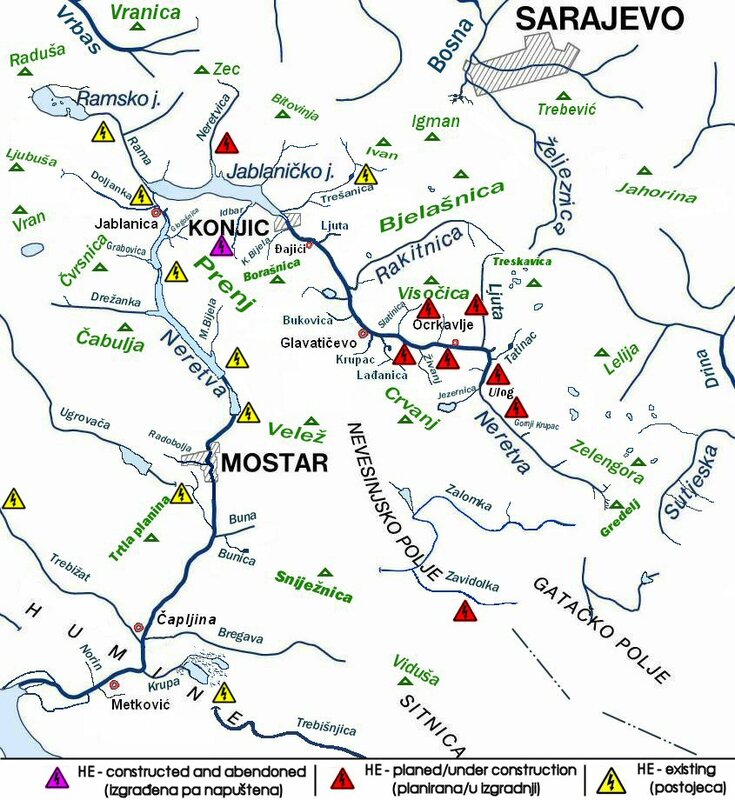 Moreover, the government of the Federation of Bosnia and Herzegovina entity has unveiled plans to build three more hydroelectric power plants with large dams (as over 150.5 meters in height) upstream from the existing plants, beginning with HPP Glavatičevo nearby Glavatičevo village, then going even more upstream HPP Bjelimići and HPP Ljubuča located near the villages with a same names . The WWF International and its Bosnian branch together with local environmental and ecological NGO and scientists actively oppose this project. The construction of HPP Dabar started in 2013 and was announced to be completed in 2016. However, only the access roads were built in 2015. In December 2015, the Government of Republic of Srpska and China International Water & Electric Corporation signed a memorandum of understanding for construction of HPP Dabar. The Federal Ministry of Ecology and Tourism of B&H demanded judicial revision of the approval decision of EIA study for HPP Dabar issued by the Ministry of Physical Planning Civil Engineering and Ecology of RS. In 2016, the Supreme Court of RS confirmed the legality of such decision. The HPP Dabar construction is ongoing but at slower pace than expected. The Dabar power station will be part of the planned 250 MW hydro power complex Gornji Horisonti, which is designed to incorporate two other smaller plants, Nevesinje and Bileca. HPP Dabar is planned to come on stream in early 2017 and to have an average annual output of 251 gigawatthours. The project is worth 176 million euro ($234 million). Other Specific environmental impact: Water salinization- water for irrigation in the Neretva delta already contains 2,000 mg of salt per liter, for the comparison freshwater contains 350 and sea water from 3,000 to 4,000 mg per liter. Development of Alternatives The WWF International and it is Bosnian branch demand respect of EU directives in the process of construction of HPP Dabar including previous research and involvement of the wider community in the project preparation phase. Why? Explain briefly. The construction work on HPP Dabar is ongoing. Although it was expected to be finished in 2016 the completion of the project was postponed due to slow progress. Bankwatch "EU-backed energy projects will harm people and the environment in the Western Balkans"
Other Comments A local official in charge of rural development in Bosnia, estimates that the annual profit of 30 million euros from selling electricity produced in new plants would be the same as from the tangerine plantations in the region.